Early within the morning, after breakfast, you're picked from your hotel by our guide who drives you to the eastern part of Republic of Uganda. Enroute to Jinja you'll see Mabira forest, River Nile, lake victoria, tea and sugar plantations around Lugazi and Kakira. Take Tirinyi upgraded highway to reach Mbale city in one hour's time from Iganga. Lunch at Mbale Resort. Then explore the glorious Sipi falls and adjoining areas. Have dinner and overnight at Mbale Resort (classic)/Volcano (classic)/Sipi falls rest camp (budget)/Kapkwai cottages (budget). After breakfast with packed lunch and snacks, this day is dedicated to 1 day hike where the park guides)/Porter(s)are ready to take you up to the mountain using any of the chosen 3 main trekking trails. Budadiri Forest exploration centre - Kapkwai and Kapkwata are all places you begin to decide on to ascend the spectacular mountain. Dinner and overnight at Mbale Resort (classic)/Volcano (classic)/Sipi falls rest camp (budget)/Kapkwai cottages (budget). Begin the day with breakfast able to oppose to capital of Uganda. This can be the time you may explore Jinja city and its major attractions just like the supply of Watercourse River, Bujagali falls, Itanda falls, Jinja Sailing club, Masese fishing village etc. come back to capital of Uganda inward early evening. 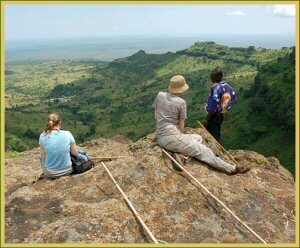 Note: counting on your available number of days and budget, it's possible to increase your itinerary to cover Nyero early man rock paintings in Kumi, or One-day white water rafting, kaying and bugy jumping along river nilewith Adrift Uganda Ltd. estimated distance is approximately 300 Kms. estimated transit time is approximately 3half Hrs.